I wore this yesterday to go shopping with Emily, who is here visiting and Stephanie, who owns my favorite jewelry store, Love Always. We had so much fun. We went to a huge outlet mall that we have here in South Florida and lunch. Then we went to our favorite Mexican restaurant for dinner. Meanwhile John and Matt went to dinner with a bunch of Matts friends. Emily and I met on Instagram and had a instant friendship and it is so funny because our husbands are meeting for the first time and they also had a instant friendship. I love when I get to spend time with Emily. We always have the best time together and she is honestly one of the sweetest and funniest people I have ever met. We have so much in common and it is just always a easy really fun time. I am really obsessed with this dress from Goodnight macaroon. It runs a little small so I would say go up a size. But it is one of my favorites. I love the little bow detail on the back. I feel like I am obsessed with everything that I get from Goodnight Macaroon. It is worth the wait for the shipping! 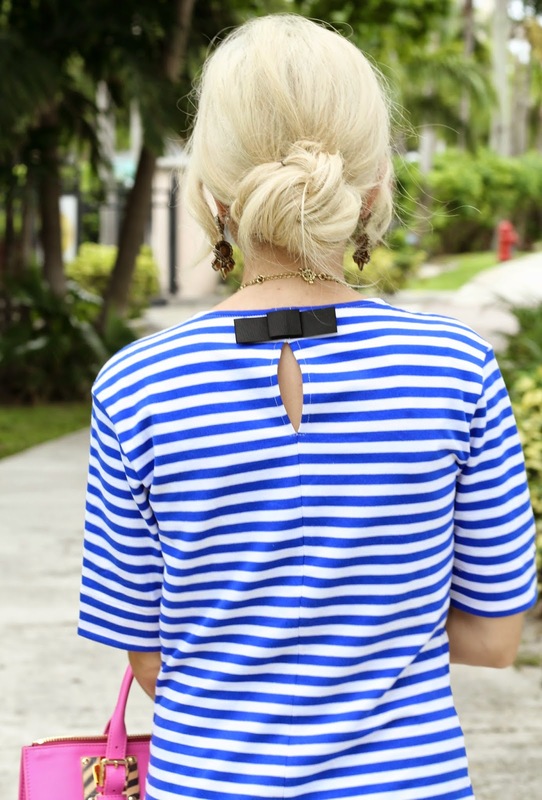 Love your striped dress! The pops of pink look look great with it! Fab look! Loving the dress. I love everything about this! I seriously want that bag and those shoes!! Love the color combo and that striped dress is gorgeous on you! Well you are just beautiful! So glad to have found your blog through Trend Spin! That dress is amazing. How fun to turn a blogger friend into a real life friend. Love it! Adorable dress! Such a cute and fun look. You look absolutely stunning, and what a beautiful dress. Also love the bag and the wedges are just perfect. that dress really is super cute! and I love your shoes. a perfect outfit for shopping and lunching with a great friend. I love those pink bow wedges more each time I see them...they're adorable and look fantastic with the striped dress! I am dying for those shoes!! How did you think they fit size wise? I can only find them online on Amazon so I am worried about purchasing online! I want your bag right now! Such a cute look! Loving your dress and shoes! Such a cute dress! Love your Sophie Hulme! So pretty- I love the pop of colour! Cutie pie dress - love the pink bag. Looking beautiful :) Been thinking about you! Who is your photographer??? I just can get over how amazing each and every one of these photos are! You must have an excellent photographer!!! Jade - do you mind sharing what size you ordered in the dress? I'm not sure what size to order even after studying the size chart.